Linfield College students learn to think critically, solve complex problems, and communicate empathetically with a variety of different people. This is a powerful skill set for those interested in pursuing a health-related profession. Combine these attributes with small classes, access to research opportunities, and four years of advising, and you’ll have all the tools to succeed in health care. Financial aid: Ninety-seven percent of all enrolled students receive some type of aid. Academic scholarship: A 3.4 or higher cumulative high school GPA may qualify a student for a merit-based scholarship ranging from 35%–60% tuition. Family income is not the only indicator of eligibility for financial aid. Study abroad programs: Nearly 50% of Linfield students take part in one of our study abroad programs: semester abroad, year abroad, and a four-week January Term abroad. Linfield will pay the first round-trip airfare for most travel. 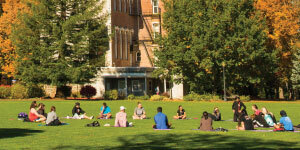 At Linfield, learning is an open and engaging activity. Our average class size is 14, with a student-faculty ratio of 10:1. Students in our health-related programs have a significant number of hands-on experiential learning opportunities for collaborative research, summer fellowships, medical internships, job shadowing, and community service, which provide excellent preparation for health careers. In addition to our many health-related majors, Linfield offers strong pre-professional programs such as Pre-dentistry, Pre-medicine, Pre-medical Technology, Pre-optometry, Pre-occupational Therapy, Pre-pharmacy, Pre-physical Therapy, Pre-physician Assistant, and Pre-veterinary Medicine. In each of these programs, you work one-on-one with an advisor who has current information about entrance requirements for postgraduate work, including information on the changing MCAT medical school standardized exam and entrance requirements. Linfield has been called one of the “Best in the West” (The Princeton Review, 2018), but this is not a school that rests on its laurels. The past few years have seen the addition of exciting new interdisciplinary majors such as Biochemistry and Molecular Biology. And Linfield was recently awarded a significant grant that will support the scientific scholarship and research of Linfield faculty and students. The grant funds have purchased a state-of-the-art microscope system that will enable high-resolution imaging and data analysis and strengthen Linfield’s molecular and cell biology facilities. The faculty devote themselves to bringing out the best in their students, and it works. In recent years, Linfield has had 36 prestigious Fulbright Scholars, a Udall Scholar, and a Boren Scholar to Kyoto, Japan. Our students have also gone off to graduate and medical programs such as Yale Medical School, Oregon Health & Science University, Johns Hopkins University, and UCLA. Central to a Linfield education is the power of relationships. The relationships made here will inform the rest of your life. You’ll collaborate with professors and fellow students to solve problems and advance your knowledge about the world around you. Whether you’re stopping by during office hours to get help, studying in a group, or bonding with your teammates, you’re building relationships that are not only fun but help lay the foundation for your future. At Linfield, your education is more than just a list of classes to check off. Once you uncover some of your passions, you’ll be able to dive deep into your chosen course of study. Our well-rounded curriculum spans the arts, humanities, social and behavioral sciences, natural sciences, and pre-professional programs to give you a solid foundation for your chosen career path. We also believe in the power of learning by doing. 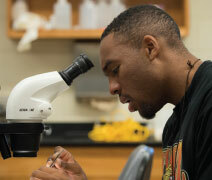 Linfield’s hands-on learning opportunities include research, internships, and our numerous options for study abroad. Students perform research alongside their professors and peers and attend conferences across the country to share their findings. Over 80% of students complete an internship before graduation, helping make off-campus connections for life after Linfield. And nearly half of our students spend time studying abroad. At Linfield, we believe so strongly in the importance of studying abroad that we’ll even pay for your first round-trip airfare. As you walk through Linfield’s 189-acre park-like campus, you’ll notice this is no ordinary place. Our vibrant campus offers a cool mix of traditional architecture and modern amenities. And don’t be surprised if you’re greeted by a professor heading to class or a student picking up a latté at our on-campus Starbucks. Whatever you’re into, we probably have a club or organization for it. Besides our 40 student-led clubs, we also offer 14 performing arts groups, 300 leadership positions, four media organizations, intramural and club sports, and 19 NCAA Division III athletic teams. And when you’re ready to explore further, Linfield is within easy reach of mountains, beaches, and Portland. For 160 years, Linfield has shaped the lives of our students by advancing a vision that connects learning, life, and community. Linfield students are making the most of their experiences and aren’t taking them for granted. They are contributing a lot to their communities and learning much in return. And as alumni, Linfield Wildcats are carrying that tradition at home, abroad, and even to space. Contrary to what we sometimes hear, bigger isn’t necessarily better. 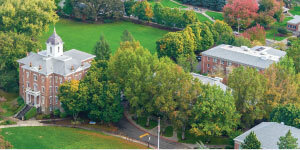 That’s why at Linfield College, we’ve created a unique, close-knit environment where students from different backgrounds are encouraged to learn, explore, and stretch themselves. Around here, you’ll get to know your professors and they’ll get to know you. You’ll be challenged to find your true passions and expand your intellectual sensibilities while growing into a well-rounded, whole person—the kind of person who can have an impact on your local community and your world. That’s the power of a small college. That’s the power of Linfield.